There was a moment — and not a particularly brief one, either — when I was certain they were going to bounce the snap, or airmail it toward Woonsocket, or let half a dozen hungry, fire-eyed Baltimore Ravens through to devour Ryan Allen and block the punt besides. All throughout the late afternoon and evening on Saturday, the New England Patriots were falling behind, edging ahead, and then barely holding on against the Ravens. They shook the dust off the most obscure pages in Bill Belichick’s book of spells. Julian Edelman threw a touchdown pass to Danny Amendola on which Rob Gronkowski provided pass protection. (The Raven in front of Gronkowski simply stopped dead in his tracks, unwilling to entangle himself with Gronkitude and unable to get back in coverage. “The Beast,” said Edelman. “The Big Dog’s gonna eat what he wants to eat.”) New England lined up in a mysterious formation with four offensive linemen. This so exercised Baltimore coach John Harbaugh, who was vividly red-assed through his entire postgame press conference, that he vowed to take up the matter with the NFL office the next time the NFL office needed to find work for a retired FBI director or something. Had Harbaugh ever seen that funky lineup before? Did he think it was cheap or dirty? Harbaugh’s tap dancing prompted Tom Brady to unleash Snarky Tom after the game. “Maybe,” Brady said, “those guys gotta study the rulebook and figure it out.” Snarky Tom is great copy. So, yes, it was more than a passing notion that something would go awry with 14 seconds left and New England punting from its own 15-yard line. That was about the only thing that hadn’t yet happened, the only blind hairpin turn the game hadn’t taken. And, in fact, the snap was rather low, but Allen got his kick away, and the Patriots knocked away a last-ditch “Magnificat” in the end zone, and went off to the AFC Championship Game with a 35-31 win that was nowhere near as sane as the score indicated. The Patriots won despite gaining 14 yards on the ground, and Brady accounted for almost a third of that total with a 4-yard touchdown run. The Patriots won without sacking Joe Flacco once. The Patriots won despite falling behind by 14 points twice. Nothing about this game made any sense, not even the way it ended, with obscure safety Duron Harmon closing perfectly on an ill-advised Flacco pass at the left pylon to stifle the last real Baltimore drive with 1:46 left. 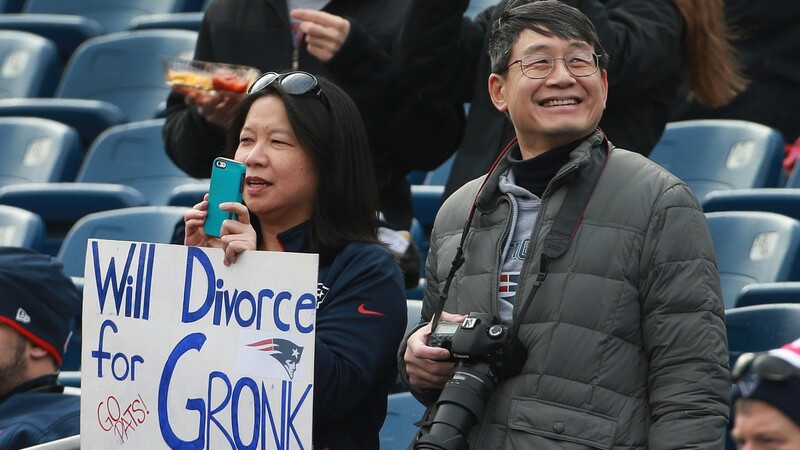 Ultimately, though, it was an eccentric game that cried out to be Gronked, to be broken into pieces and reassembled by the sheer Gronkosity that is the dark matter that holds any Patriots game together, to be governed by the gravimetric forces of the eternal Gronkosphere. He creates a new reality, and then he makes sense out of it. He Gronks up the world, and then he Gronks it back together again. He caught seven passes, none more important than the first two. The Patriots had done nothing on their first possession, and the Ravens already were leading 14-0. Flacco had completed nine of his first 10 passes for both Baltimore touchdowns. What New England needed was a long drive, not merely to close the gap, but also to give its defense a chance to regroup. On a third-and-8 from the New England 24-yard line, Brady found Gronkowski over the middle for 16 yards and first down. Then, on the next play, Gronkowski got away clean down a seam in the left side of the Ravens secondary and Brady found him for 46 more yards. You could almost feel the tension go out of the entire New England team. If it had been a boxer, you would have said New England had found its feet again. In addition to the 108 yards he gained on his seven catches, and in addition to his third-quarter touchdown on which Harbaugh left poor Will Hill out there alone on Gronkowski, who bulled past Hill on the inside to score, Gronk was sent out at the end of the game to help defend against Flacco’s last-second heave toward the Patriots’ end zone. Brady is the team’s face, and Belichick its brains, but Gronkowski has become the renegade soul. It is more than simply being a brass band of a public personality, although he certainly is that. It’s also that he has become the focal point for all of the odd stuff that accrues around any successful team. For example, just this week, it was revealed that someone by the name of Lacey Noonan had published A Gronking to Remember, the first volume of what Noonan called the “Rob Gronkowski Erotica Series.” (That faint sound you hear is the collective roar of five generations of NFL players spinning at 78 rpm beneath the sod.) Amazon pulled the Kindle volume because the image of Gronkowski on the cover also showed a memorial patch worn by the Patriots to honor owner Robert Kraft’s late wife, Myra. So Lacey Noonan fans ordering online will have to content themselves for the nonce with other entries in the author’s oeuvre, which includes I Don’t Care If My Best Friend’s Mom Is a Sasquatch, She’s Hot and I’m Taking A Shower With Her. (Which, I believe, was the original title of Sense and Sensibility.) Gronkowski didn’t ask for this, of course. Let us face the facts plainly. Some people are natural magnets for the weird and the wonderful. Gronkowski is plainly one of those people. He still has the wide eyes and the broad smile of someone who is continually surprised at everything about this very preposterous profession of his. He’s also far and away the best player at his position in the league, and, perhaps, one day, he will be reckoned to be the best tight end who ever played. He has had serious injuries and has bounced back from all of them, and, while he is fluent in the PatriotSpeak that is characteristic of all of his teammates, there is something undefinably goofy in the way he rolls out the clichés. It’s not that he doesn’t take them seriously. He does. It’s just that you can see in him a lot more percolating behind all the talk about doing your job and letting your teammates do theirs, and playing one game at a time, and so forth. It’s not just that he believes it. It’s that he believes it. Some players are Belichick converts. Gronkowski is a Belichick acolyte. They move on now. But it is a different New England team even from those that have been so successful since the turn of this century. There is an assurance here that goes beyond merely being confident in your own abilities and those of your teammates. There is a kind of resilience to this bunch that bespeaks a group of people who take their work, but not themselves, seriously. They are close to Gronking up the whole damn thing again, and they’re making merry doing it, and if you don’t like it, well, your mother’s a Sasquatch.